I found him sitting on his bench. Into the slate black water. Playing tag across the skies. To follow every pirouette and dive. Behind a hedge of bayonets. He smelled not brine, but sour sweat. And bound in an eternity of pain. Where his comrade, the sea, spoke not. This poem was born of a walk from Langland Bay with Paul Morgan, Alan Figg and Lou Bowyer. Not being fully recovered, I did not venture down into Caswell, thinking I could not cope with the climb back and so I made my way back slowly whilst the Musketeers completed the walk. 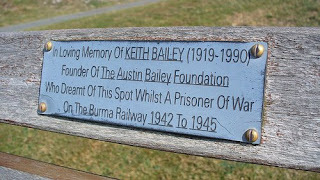 It was then that I found a bench overlooking the sea with the above inscription.….